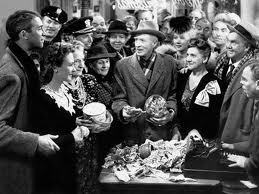 It gets me every time, Frank Capra’s It’s a Wonderful Life. Tears begin to fall at the sight of the first scene and trickle down my face in little bursts throughout the film until the end, even though I’ve seen it maybe a dozen times. George Bailey was one of the first roles I’d seen Jimmy Stewart play. I fell in love with his mild features, his unusual, round voice, his tall graceful physique. I fell in love with his full lips, strong jaw, those puppy dog eyes and the characters themselves that he’s played. I’ve long had recurring dreams of the actor as my good buddy. In one dream I was waving goodbye to him after we’d spent the day together. He sailed off in a big yellow school bus, his long suited arm reaching out the open window to bid me farewell. I was sad to see him go. I’d say George Bailey is the quintessential American hero—a small town boy with big dreams who never realizes them because of his self-sacrificing altruistic nature. At least as much as the actor’s appeal of the mild mannered character he plays is the film’s poignant premise; that one life touches so many others in profound ways that we can never really know unless we step outside of ourselves and look in. George Bailey gets a rare, though painful, chance at doing just that. Each character we meet in the quaint town of Bedford Falls is inextricably linked to another in a beautiful web of humanity: taxi driver and cop, bar tender and son, mother and restaurant owner, housekeeper and druggist, entrepreneur and war hero, high school buddy and brother, father and child. All would be lesser were it not for the other. I think about this kind of connection between people, about how what I say or do might affect someone—a loved one, a friend, a stranger—and how my actions and words could alter some hidden trajectory, like that story of the man who went back in time and changed the course of history simply by stepping on a butterfly. If only—whenever possible—we decided to give instead of take, to smile instead of scowl, to act instead of lay idle, to melt instead of stand firm, to love instead of hate, to build up instead of break down, to embrace instead of resist, to share instead of hoard, I’d have to think that this world would be a better place, where we all might live a much more wonderful life.